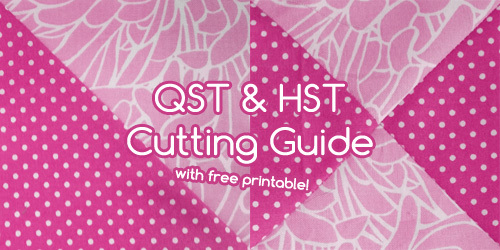 When I learned about chain piecing, my quilting life changed for the better. 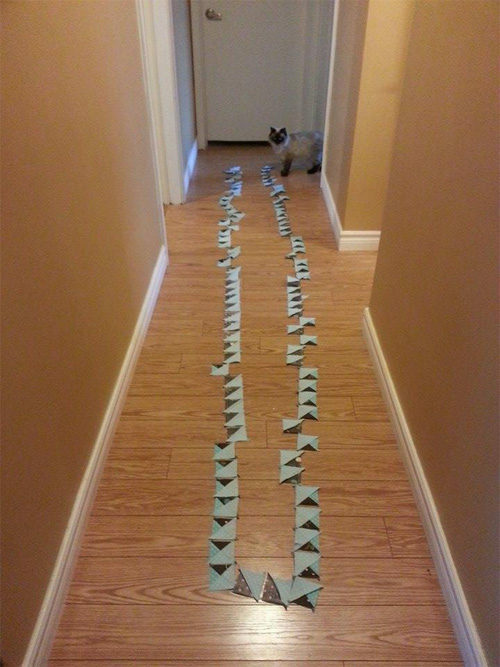 I had already made several quilts without chain piecing when my mother asked if I was using this method. I had no idea this was a thing! I tried it out, and now I chain piece basically anything that requires the same repetitive sewing over and over. What are the advantages of chain piecing? It’s quick because you don’t have to start and stop your machine as much. You waste less thread since you don’t have a long thread tail at the start and stop of each of your blocks. Additionally, you can leave your pieces joined if you need to pause your project for the night without worrying that one of your cats will make off with one critical piece in the night (cough cough, not that that ever happens, right?). 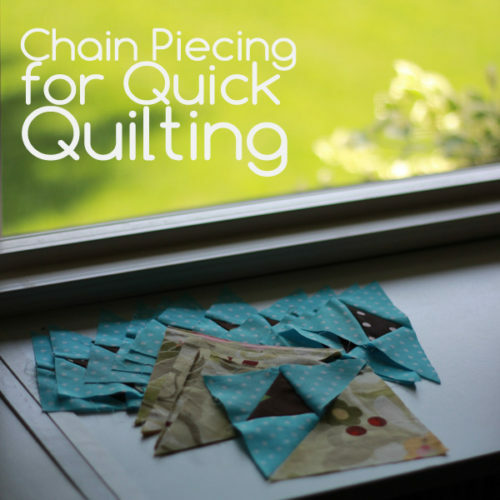 So what is chain piecing? 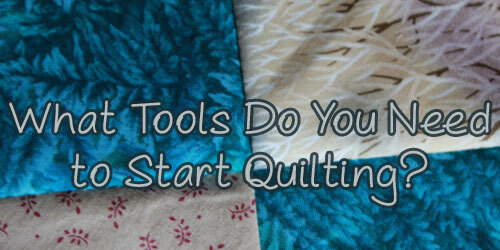 Think of an action that you need to complete many times during the making of a quilt project. For example, joining a triangle to another triangle. Normally, you would place both triangle pieces facing each other into your machine, start sewing, and then when you reach the end, you would simply lift your presser foot, snip, and then start again with a new tail of thread. 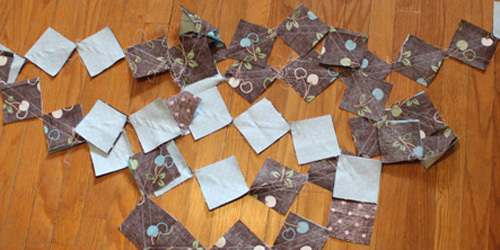 With chain piecing, you don’t need to stop and start from scratch for each unit. When you reach the end of one seam, simply lift your presser foot (don’t snip! 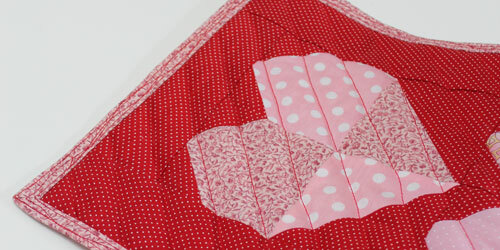 ), line up your next seam that needs to be sewn, leaving no overlap but no gap either. Put your presser foot back down and continue sewing. Once you have all your seams sewn, you can take a pair of scissors or snippers and cut them apart. You can use this method to mass-produce many types of blocks. Once you press open all of the units, it’s a very satisfying feeling! 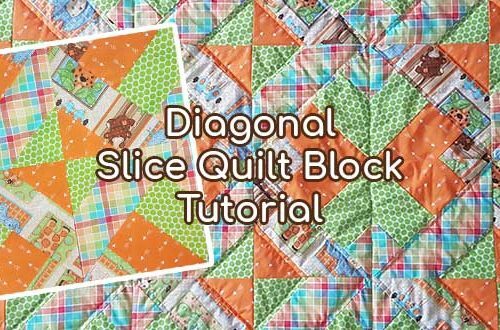 Chain piecing is a great way to mass produce blocks or units that you need for a quilting project. 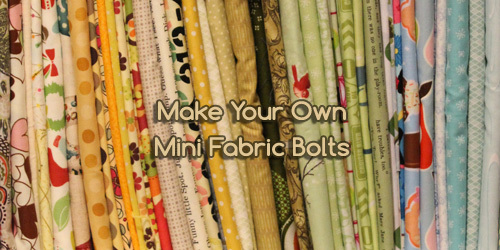 You can cut out all the fabric you need at once, sew them together all at once, snip all at once, and suddenly you have all the components you need for quilt assembly on hand and ready to go.